Solution Saddles Customer Stories: Mother and daughter are delighted with the difference their SMART Native GP saddle has made to their cob mare. 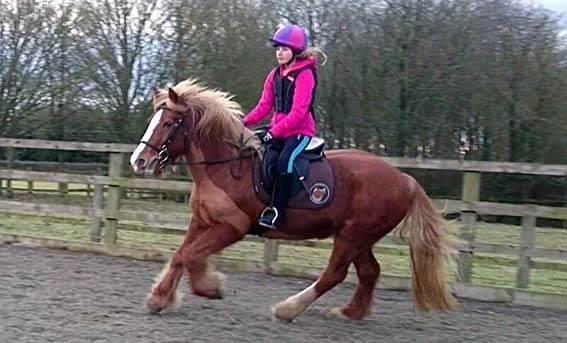 Mother and daughter are delighted with the difference their SMART Native GP saddle has made to their cob mare. "The SMART Native GP saddle is awesome; It has been one of the best investments we have made; expertly crafted and amazing to ride on. My daughter and I share our 14.1 cob mare who changes shape through the seasons, having to constantly adjust our treed saddle was a frustration. 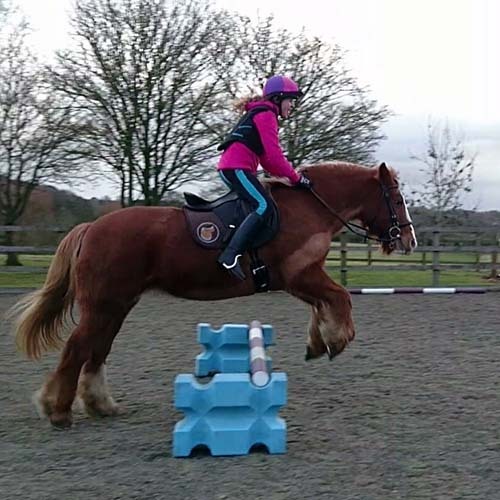 Now, when riding in our SMART Native GP saddle, we can feel Balloo's movement and consequently we are totally in tune with her. We can feel and see the difference it makes to her. Before we had the SMART Native GP saddle Balloo would run out at jumps, now she is happy to jump straight over, as the photo shows. Balloo has started to flex more and her bends and circle work has improved. Since using the SMART Native GP saddle, Mia and Balloo won their first ever dressage competition - only Intro A but it was an awesome start. The customer service and advice we received was outstanding; the staff were so supportive. I ordered the saddle on Thursday and it was delivered Friday. This level of service sets the bar high for others to aspire to.